Shvon Lowe was going along with a friend’s invitation in December 2014 when she decided to sign up for the annual springtime 5K walk/run in Houston sponsored by Sisters Network, the only national breast cancer survivorship group focused on the African-American community. She wasn’t a jogger and she didn’t have a particular patient in mind. Little did she realize that before she ever got to the race, she herself would enter the sisterhood of women with breast cancer. At age 34, Lowe was diagnosed with stage 2A triple-negative breast cancer after undergoing an ultrasound to check out a suspicious lump. She soon found out that 18 members of her family — her paternal grandmother, aunts and cousins — had had breast cancer. Then came the discovery that she had the BRCA1 gene that put her at a high risk of breast and ovarian cancer. Even though she had started chemotherapy, Lowe still decided to participate in the 2015 run. And you can bet that she’ll be there this year on April 16 for the 7th Annual National Breast Cancer Stop the Silence 5K Walk/Run. At least 10,000 people are expected to participate in what is the largest such fundraiser for African-American women with breast cancer. Through a cancer journey that has included a double mastectomy, Lowe has not only benefited from Sisters Network programs, but she has also become an ardent volunteer for the organization and an ambassador for other women facing breast cancer. Those sentiments are exactly what Karen Eubanks Jackson had in mind when she founded Sisters Network in 1994 during an era when breast cancer was not always openly discussed in African-American communities. She had been diagnosed with early-stage breast cancer a year earlier at the age of 50 after she nagged her doctor to further investigate a “fleshy lump” that she could sense — a lump that didn’t show up on a mammogram. An ultrasound confirmed her suspicions. As it turned out, Jackson had to create it. Today, 22 years later, that organization is a national one that has served more than 3.7 million women. Sisters Network offers a variety of programs and materials designed to raise awareness about the importance of early breast cancer detection and familial history—and then help women overcome barriers to access to services. Sisters Network programs include the Gift for Life Block Walk, which are locally organized events in which volunteers canvass a neighborhood to provide information and direct residents to a mobile mammogram services; Teens 4 Pink, which aims to educate girls ages 12-16 about breast cancer so they can help older women in their families; and Brothers for Sisters, a recently launched initiative to help men understand the needs of the women in their lives who may face a breast cancer diagnosis. There also are patient navigation services to help connect women with medical services. 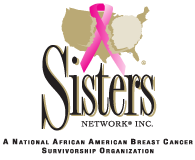 Additionally, Sisters Network provides a Breast Cancer Assistance Program to help women handle the financial challenges that accompany a diagnosis. Funding may be used to help with health insurance problem such as a lack of coverage or high deductibles as well as with lodging related to treatment or with prosthetics. For Lowe, one of the most striking contributions of Sisters Network is the camaraderie and spirit of sisterhood that the organization fosters. “I find that they have a big heart,” she said. For more information about the upcoming 7th Annual National Breast Cancer Stop the Silence 5K Walk/Run and other Sisters Network initiatives, visit www.sistersnetwork.org. 1. DeSantis CE, Sigel RL, Sauer AG, et al. Cancer statistics for African Americans, 2016: progress and opportunities in reducing racial disparities [published online ahead of print]. CA Cancer J Clin.